Alicia E. Goranson is an author and playwright, a recent transfer to Seattle. 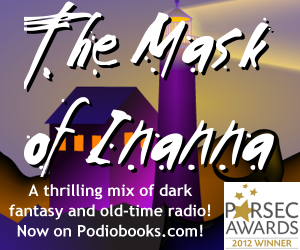 Her audio drama “The Mask of Inanna” won the 2012 Parsec Award for Best Speculative Fiction Audio Drama (Long Form). Her writing has appeared in anthologies including Take Me There, Pinned Down By Pronouns, Best Lesbian Erotica 2007 and in Other Magazine. Her novel Supervillainz is a 2006 Lambda Literary Award Finalist and the co-winner of the 2005 Project QueerLit award, and was published by Suspect Thoughts Press. The Post-Meridian Radio Players performed her plays annually at their Tomes of Terror Halloween shows from 2009-2010 and 2012. She performs all across the country. Step forth, ye mighty, and learn of her works beyond.